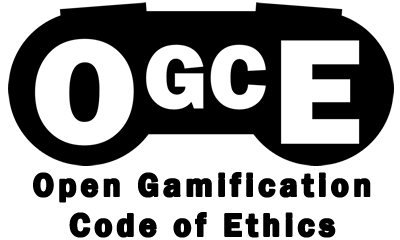 I will state now, I am not claiming to be an expert on habits, however – I wanted to share some thoughts on how gamification can help with habit building. There are several habit or behaviour models out there. 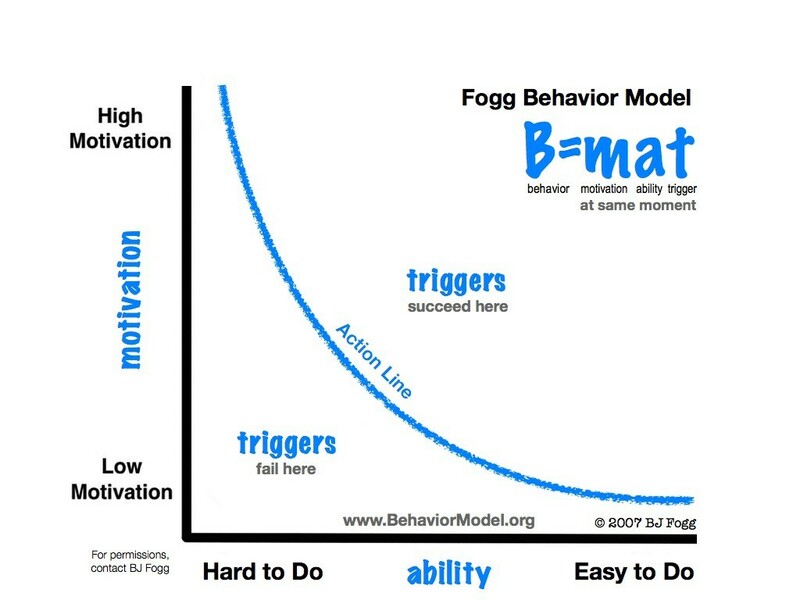 My two favourites are Nir Eyal’s Hook model and BJ Fogg’s Behaviour Model. For the sake of this blog, I am concentrating on the Fogg model, I personally have a better understanding of this one. I am reading Nir’s book at the moment so expect me to expand on this concept soon! Fogg states that there are three things that need to fall in to perfect alignment for behaviours and habits to change; Ability, Motivation and Triggers. As you can see from the graph, things that are hard to do need greater levels motivation to do them, whilst things that we are not motivated to do in some way need to be easier to do. Either way, you need triggers at the right time to actually do them in the first place. Let’s take an example of time sheeting system. Very often these are complicated and very user un-friendly. Whilst you may be motivated from the point of view of “I have to fill this in or I wont get paid” (loss aversion and fear), really it holds no interest for you. The fact that it is also hard to do makes it doubly troublesome for people. Usually a few days before your time-sheet is due, you may get some reminder about filling it in, but the likelihood is that this comes at a point when you are busy and gets ignored. So on Fogg’s chart we are in a problematic area because motivation is pretty low and the complexity means that ability is also low. Add the fact the triggers are pretty weak and you can see why so many companies struggle to get people to get time sheets and expenses done in a timely fashion, it is not habitual for many employees – it is a pain in the back side! Gamification can help with each of these three factors in different ways. If people are educated to understand what the benefits are of getting time sheets in on time are, beyond htat of not being paid, then this could help. 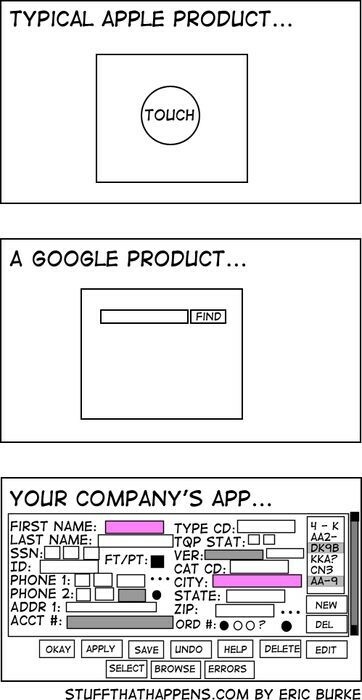 Give users a sense of purpose by explaining the costs to the company and the people. Explain how much money could be saved if people did this without constant chasing and most importantly how this saving could be fed back to them in the long run. This may go towards increasing motivation. Also, educate them in the most efficient way of using the system. With luck, the system will be straightforward enough to not need this, but if it isn’t then you need to help people as much as possible. This will go towards increasin peoples ability and making it easier in the future. As I eluded to in the previous paragraph, make the system easier to use. 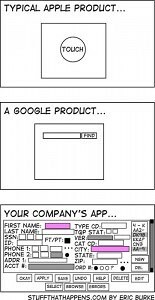 There is a joke meme that went around ages ago about how your enterprise system compares to Apple and Google ideals. Many people said that it was unfair to compare them to enterprise products as more information needed to be collected. The truth of the matter is, your employees don’t care about that in the slightest – that is your problem. They have been raised on products that are becoming simpler and simpler to use in the consumer market, whilst it often seems that enterprise and internal products are getting more and more complex to use. Whilst you may not be able to get your expenses app to only need one text box – you can certainly make it simpler and easy to use. Make sure it is mobile, give people the ability to enter information and scan direct from their mobile. Make the app web based and accessible. Don’t just show hundreds of drop downs, try to give the ability to users to personalise their view so that it only contains their most common tasks. All of this will reduce the friction users come up against when they use the system and thus increase their ability to use it. 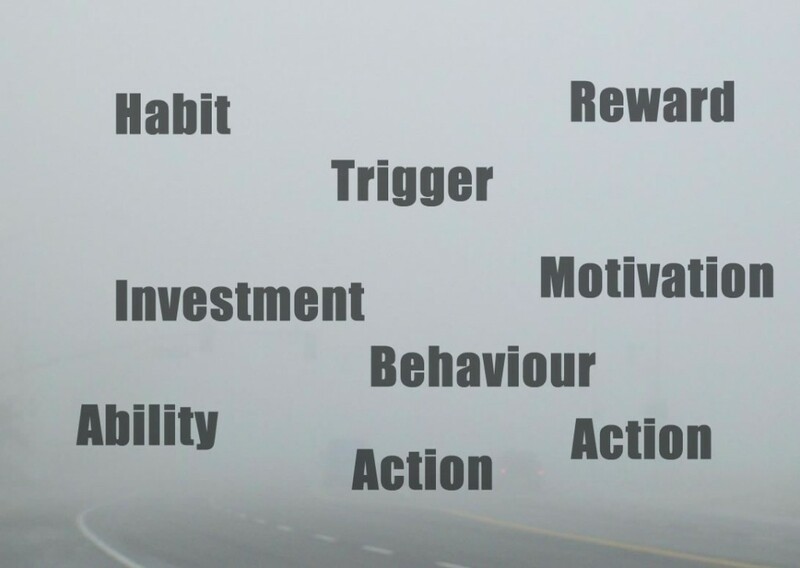 Fogg’s model of Behaviour change revolves around the use of triggers. You may be motivated as hell to do something and it may be the simplest thing in the world to do – but until it has become habitual – you will need to be triggered at a good time to do it. Sending an email at an appropriate time of day may do it. Don’t send it at lunch time – no one will read it and if they do, they will be eating their lunch so wont act on it. Don’t send it first thing as they will be busy with their morning routine. Don’t send it after hours as it will get ignored. Send it during the day, at a time when the morning rush is over and they are settling into day to day work. The exact time comes down to personal culture. Maybe there is a common time for coffee breaks, time the email to come out just after that. The other thing is, send more than one, that way it has more chance of being seen. If your system is mobile friendly – send a text. 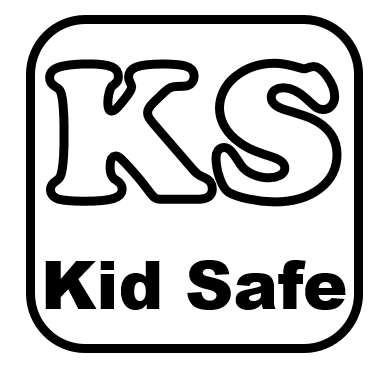 Whatever you do – do not send a text or any kind of mobile notification if your system can not be accessed easily from a mobile device! Thank people for getting things done when you wanted them done. Positive re-enforcement is much stronger than negative. So thank them and let them know that their effort has been appreciated. Personally I much prefer speed notifications on roads that thank me for sticking to the speed limit rather than only telling me off for going too fast.